Bread is sort of my “thing”. I think I’m invited to some parties just because it’s assumed I’ll bring homemade bread. When I go to friends’ houses, I’m often bearing the gift of bread. As I like to give away bread, I bought special paper bread bags from King Arthur Flour a few years ago, to have something to transport the loaves in. They were good bags, with tiny holes to allow air circulation, which is good for crusty breads, and they came in packs of 100. I realized the other day that I was just about out of the paper bags so I went to King Arthur to order some more and was dismayed to find they no longer sell them. Thus began the great hunt for paper bread bags. I can’t find them anywhere in packs of less than 500, and even when I thought maybe I’d just buy 500 and sell half of them on eBay, none of them seemed as good as the kind I had. I was beginning to get very annoyed. My googling for paper bread bags gave me the idea, however, to make cloth bags. Since I’m already making cloth gift bags, I don’t know why this thought didn’t occur to me earlier. The best part about this idea is the fact that linen tea towels are the perfect size for making bread bags. That’s my favorite part because it means no cutting – I can’t cut in a straight line even with a rotary cutter – and no finishing seams! AND I get to shop for vintage tea towels, which is fun! This is a very quick, easy, inexpensive, and useful craft item. If you don’t bake your own bread, these bags are good storage for artisan breads you buy in a bakery as well. As I’ve said before, I’m AWFUL at sewing, so if I can do this, you can too. To determine how much string you need for a regular artisan loaf bag, multiply the width of the towel by two and add 10″. So if your towel is 16″ wide, multiply 16 x 2 to get 32, then add 10 to get 42″. If you are making a baguette bag, just add 10″ to the width of the towel, so for a 16″ wide towel, cut 26″ string. Wash and iron your tea towel. Now, ironing is something I never do. I don’t even know where this iron came from; I found it in the laundry room and I think it’s the landlord’s. But some of my towels were pretty wrinkled and I have a hard enough time trying to sew in a straight line on smooth fabric, so I figured I’d better iron them. Which is bad news because Fortinbras bought and refinished that table for me as a gift. I asked him what I should do and he said, “buy an ironing board like every other American; what’s wrong with you? !” He also said he’d look at the photo I sent him and call me back with advice but I haven’t head from him since so I think he’s plotting ways to strangle me. (Actually, F-dog is extremely busy right now and I shouldn’t have been bothering him in the first place.) So, um, iron your towel some different way than what I did. As for me, I’ve learned my lesson and will never iron anything ever again. So anyway, here’s my ironed tea towel. This tutorial is for a regular bread bag. I’ll explain the how to make a baguette bag at the end (it’s actually even easier). Fold the top and bottom edges over (wrong sides together), by about an inch (depending on how wide your string is), and pin. Note that the top of some tea towels is already folded over like this so you can insert a dowel for hanging. If your towel is like this, half your work is done for you: just pin the bottom edge. Sew close to the original edge. When you’ve done both the top and the bottom, fold the towel in half, top to bottom, right sides together, and pin. Sew these two seams, being very careful to start at your first seam, that is, don’t sew the loop you created above closed. Look where my needle is in the picture and start sewing there. Stick a large safety pin through one end of your string. It may help to put a bit of tape on the end of the string first so it doesn’t unravel. Insert the safety pin into one of of the top hems. Holding the safety pin through the fabric in one hand, scrunch the fabric onto the pin, then pull the pin through a bit. Keep going until the safety pin comes out the other side. Then stick it in the other hem and repeat the process. Pull the string so the ends are even and knot the ends. Turn the bag right side out, and you’re done! To close, just pull the strings. To make a baguette bag, hem just the top of the towel as described above, then fold the towel in half lengthwise (right sides together) and sew the side and the bottom. Insert the string in the same fashion. These bags won’t be long enough for a real French baguette, but they are long enough for baguettes made in most home ovens, and they’d probably be plenty big enough for storing leftovers of store-bought baguettes. Here are all the bags I made today. My favorite towels are the souvenir travel towels. I just got two map of Scotland towels today, too, that I’m excited to turn into bags. Let bread cool completely before storing if you can, although linen will breath enough that I’ll feel confident slipping hot loaves in when I’m in a hurry to get somewhere with them, which is often. Now, my theory of these bags is this: I’ve bought (and am still buying) a bunch of old tea towels for a couple of bucks each, which I’m going to make into bags in batches as I have a chance. I can probably make 5 or 6 in an hour. I plan to make an initial stash of 25 to 30 bags, a few of which I’ll keep for my own use, but most of which I’ll use for transporting bread to other people. The first time I take a bread bag to someone, it will be a gift: they keep it and use it (I hope). There are some people that routinely get bread from me; these people would eventually end up with more bread bags than they can use, so they can just start returning the extras to me to be refilled. Most of the bags will just be given away, though, which is good, because making these bags is the perfect craft for me: it’s cheap, it’s quick, and although it involves the sewing machine (usually a huge no-no in Renae crafts), it’s kind of foolproof. So I’ll just keep an eye out for cute vintage towels, buy them as I see them, and periodically make a bunch of new bags. I used my two Australia bags today in honor of the fact that one year ago today, I was in Australia. I think I might also branch out and make potato and onion bags as well. I bought some kumquats the other day and they are so sour they’re practically impossible to eat raw, just popping them in your mouth.I was wondering, therefore, what I could do with them. There are many recipes for candying them, which I considered doing, but we don’t eat a lot of sugary stuff. So instead, I decided to do a riff on this recipe for Kumquat Braised Oxtail. I don’t know – don’t want to know – what oxtail is, but I think it is part of a cow, so I first made some “beefy” seitan. I’ve used a pressure cooker for both the seitan and the braising and it took about an hour from start to finish. If you don’t have a pressure cooker, it will probably take about an hour and a half or a bit longer. To make the seitan, whisk together the dry ingredients in a large bowl. Whisk together the rest of the ingredients except the water in a measuring cup. Add water to make just under 2 cups of liquid and whisk again. Pour the liquid ingredients into the dry and then mix well; I do this with my hands. Form seitan into a log and slice 1/2″ slices. Put 8 cups of water or weak vegan “beef” broth into a pressure cooker (or Dutch oven), add the seitan, cover, and bring to pressure (or to a boil if you don’t have a pressure cooker). Reduce heat and pressure cook for 1/2 hour, or simmer for one hour. Chop the kumquat; remove any seeds you see (but they’re edible so don’t freak out if you miss any). Grate the ginger. I minced it for some reason and then regretted it later. When the seitan is done, quick-release the pressure, then drain. Move about 10 medallions (18 ounces) somewhere they can be spread out so they cool quickly (freeze the rest of the seitan when it cools). While the seitan is cooling a bit, rinse out the pressure cooker, heat over medium heat, add the olive oil, then add the shallots and cook until soft. While the shallots are cooking, chop the seitan into bite-sized pieces. … then add the seitan. Bring the pressure cooker up to pressure and cook for 20 minutes, then quick-release the pressure. And here it is plated, with Israeli couscous and braised baby bok choy. I was a bit worried the broth would be very sour from the kumquats, but it wasn’t sour at all, in fact, it was only subtly kumquat-flavored. The original recipe calls for straining the kumquats out of the broth, but I left them in for flavor – after cooking, they were far less sour and provided a little burst of tangy flavor. This was good but not amazing. The other day I was making the unprecedented move of checking the comments automatically marked as spam on this here ole blog, and I came across a single one that I wasn’t entirely sure was really spam. Someone identifying himself as “San Antonio personal injury lawyer” had left a comment on my Spicy Vermicelli Soup post saying my soup sounded a lot like the Vietnamese dish Bun Rieu. I looked up Bun Rieu to see if it really did sound similar to my recipe, figuring if it did, the comment was legit enough for me. It did seem a little similar – in that it’s a soup and it involves rice vermicelli – so I approved the comment, but I found myself interested in this Bun Rieu as a byproduct. It did sound delicious…but decidedly unvegan: full of crab and shrimp and fish sauce. If you know me at all by now, though, you’ll recognize that I immediately viewed this as a challenge. I shall make vegan Bun Rieu! Now, first of all, I want you to know that I have not become a spokeswoman for Nature’s Soy, although I just did a post on one of their products earlier today and I’m using two of their products in this meal. In fact, it wasn’t until just a couple of weeks ago that I even realized that several of the tofu and seitan products I’ve been buying at Super H and other Asian grocery stores are from the same company, Like the tofu puffs I use in this recipe: I used to buy them all the time to make a recipe that Mark loves (I’ll do a post on it soon), but I had no idea they were made by the same people who make the “chicken” seitan I use in my “tuna” salad until tonight when I looked more closely at the packaging. Rather than looking at brand names, I usually just immediately flip everything over and stare at the ingredients list. Conditioning is a funny thing. Anyway, on with my Bun Rieu experience. Bun Rieu is not just full of crab meat; it also contains shrimp and/or shrimp paste (as well as, often, fish sauce), all of which may seem like pretty big deterrents for veganization. I had already decided that if I could get away with using that chicken-style seitan as tuna, I could use it for crab, but what to do about shrimp paste? My first thought was actually to use some Thai green curry paste. A lot of Thai curries contain shrimp paste, so I guess I associate the two in my head, and I figured the curry paste – a vegan version of which I have on hand – is pungent and salty like I assume shrimp paste is. I’ve never had shrimp paste so this is a guess. But I wanted to see if I could concoct something, maybe something that those of you who don’t have access to ready-made vegan Thai curry paste might be able to make. So first, I’ll show you how I made vegan “shrimp” paste, then I’ll show you my Bun Rieu using it. … and crush to a paste with the pestle. Add the black vinegar if you have it, although I tasted it before adding and it was good without it, so don’t go out of your way to buy black vinegar just for this. Looks delicious, no? I ended up with just about a quarter cup. Don’t not make this because you can’t find this style of seitan. While most homemade seitan is too dense and chewy to provide the right texture, tofu would have been very good in this. It may not have been anything like crab meat, but it would have been very good. Do your mise en place: chop the onions, scallions, and tomatoes, mince or press the garlic, slice the chili pepper, chop the tofu puffs, pull apart the seitan or chop the tofu. In a heavy soup pot, heat some oil, then add the onions and cook until soft, then add the garlic and cook another minute. Add the chili peppers, fresh or canned tomatoes, and tomato paste and cook a minute or two. Add the rest of the ingredients, except vermicelli (and garnishes), reduce heat, and simmer for five minutes. Add the rice vermicelli. I wanted to show you how much I added, so here it is. That mole on my hand looks like an eye and it looks like my hand is eating the vermicelli, does it not? To assemble, ladle some of the soup into a large bowl. Garnish with as many or as few of the garnishes as you’d like, keeping in mind that I personally find lime pretty important: squeeze it all over the soup and mix in. Obviously sriracha’s a given for me too. And that’s it! It looks harder than it really is; I’ve called for a lot of ingredients, but most of them get tossed in at the same time, so this is a fairly fast meal. I thought it was really good; I was pretty impressed with myself. I have no idea if it tastes or even looks like true Bun Rieu, but I’ll make this again. This may be the most unoriginal recipe I’ve yet posted. I’m sure most vegans have already made some sort of faux tuna or chicken salad. I’ve made several, using both tofu and chickpeas, and while some of them were good, none of them really had the texture, or taste, of real tuna salad. Which isn’t necessarily a bad thing, although sometimes it’s fun to have vegan versions of childhood staples. That’s why I was happy to realize this Nature’s Soy chicken-style seitan, which I find in Asian grocery stores (even the one in N. Charleston!) has a somewhat tuna-esque texture quality to it. Possibly. I say things like that but then realize it’s been well over twenty years since I’ve had tuna. I do give Brachtune tuna, though, so maybe she could clear this up for me. If only her English lessons were going a bit better. 3-4 Tbsp vegan mayonnaise, depending on your love of mayonnaise. 1/4 tsp salt (optional) – I used Indian black salt, which would really be more for a faux egg salad (the sulphur content makes it smell, and therefore taste, like hard boiled eggs), but there are so few things I want to smell or taste like eggs that I always have a ton more of this stuff than I really need, so I used it here. Tuna doesn’t smell like eggs, but it IS smelly. Regular salt is fine, if you think you need it. Drain the relish. I like to smoosh it in a potato ricer. In fact, I use my potato ricer more for squeezing liquid out of things than I do ricing potatoes. Can you tell how dry the relish is here? I hate it when wet relish waters down my salads. Now, this is important if you’re me: transfer to a blue Pyrex refrigerator box. This is just like the container my parents always made tuna salad in. They probably still do. I think they mixed it up right in the container, which I tried to do, but it was too full to mix without making a mess. To me, “tuna” salad just has to be kept in a blue Pyrex refrigerator box. Here is a loaf of bread I baked today. It’s Hamelman’s Five Grain Bread, which is currently my favorite bread, though I don’t have any rye chops and have been substituting millet. It’s so good. I also have a ton of rolls made from that dough in the freezer and they freeze wonderfully. I’m thinking about baking a few loaves for the Falls Church Vegan Bake Sale for Haiti. Everyone always makes sweets for bake sales, but yeast breads are baked goods too, right? It’s not a faux pas to bring yeast bread to a bake sale, is it? It’s really more my niche. … top with another slice, and serve! With pickles, of course. It’s really much improved if you let it sit in the refrigerator for at least an hour or two, but I made this right away because I was hungry. Subsequent sandwiches will be even better though! Mark’s not a fan of mayo and he tends to shy away from any sort of mayonnaise-based salad, so I didn’t even bother offering him any, however, he showed up and demanded to be allowed a bite. He didn’t gag or spit it out, so I guess that’s a good sign. 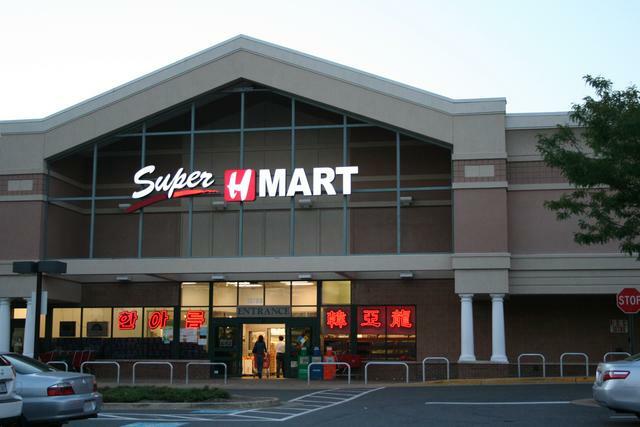 Due to a combination of factors including our trip to Charleston and, oh, a few blizzards, I have not been to Super H or any other Asian grocery store in many weeks, other than the solitary Chinese grocery store my mother-in-law found in North Charleston. I don’t know if Super H got wind of the fact I was considering moving to Charleston or if I had just missed it sorely, but for some reason it seemed to be even more amazingly awesome than usual this evening. I remember vividly the first time I set foot in Super H. It must have been 5 or 6 years ago and I’d driven down to Fairfax from Arlington, where we lived at the time, just to check out the big brother to the closer-by Han Ah Reum. I walked into the produce department and immediately gaped in amazement. I remember digging my Blackberry out of my purse and immediately IMing Mark: “I WANT TO LIVE IN THIS GROCERY STORE.” Super H is HUGE and their produce selection is simply unbelievable. And CHEAP! Then there’s the entire aisle devoted to rice, and an entire aisle devoted to noodles, an entire aisle devoted to soy sauces and vinegars….it’s just amazing. You do have to watch out for certain areas – there are a lot of tentacles and other scary things that need to be avoided, but that’s really only a problem in the frozen food aisle, otherwise that stuff is confined to the seafood department in the back that I just pretend doesn’t exist. Not only is Super H jam-packed with awesomeness, but they’re always playing good music. Like The Smiths, Depeche Mode, Erasure. I don’t know how a Korean grocery store chain got a hold of my high school record collection, but I’m not complaining. Anyway, I went completely nuts tonight. I should have taken a picture of everything I bought, but it didn’t all fit on the kitchen island at one time. I filled four big reusable grocery bags to the point they were nearly busting, and the bill was only $100. If I’d bought that much at Whole Foods, it’d have been $500. Not that Whole Foods has half the stuff I bought. I think the blizzards have mentally scarred me and I decided I’d better pack my pantry with enough stuff to see us through an entire year or something. No recipes tonight – it’s very late so I’m just having a huge assortment of fresh banchan supplied by Super H, and some sushi rice – but I wanted to share a few items I picked up that are new to me, with the hopes maybe some of you will supply me with ideas on using it. I thought this looked suspiciously like shiso, which can be hard to find, so I snatched it up. Turns out I was right: it’s Vietnamese shiso, and apparently it has a stronger taste. There’s a pretty large amount of it for $1! I got this because it looked a little bit like fish cake, so I was thinking I could use it in something that calls for fish cake. I’ve never had fish cake before, so I’ll have no idea if it tastes like it or not. I’ll probably add seaweed to whatever dish I come up with to make it fishier. Anybody tried a product like this? Since the tia to is supposed to be good with seafood dishes, I’m thinking about combining these items? I think I’ve identified this as doenjang, so I’m pretty sure it’ll end up in an awesome Korean soup, but I’d love to hear ideas on this. This one is so simply bizarre, I couldn’t pass it up. I’m not sure if I will actually eat it, although it is vegan. It’s fried wheat gluten with pickles. Apparently you put it on spaghetti?! I’ll definitely do a post on this, even if it’s not edible. Not entirely sure why I bought this because it’s just soft tofu, which I can easily make myself, with a syrup you mix in to make a dessert. The syrup is just high fructose corn syrup with ginger flavoring, so I imagine I’ll be throwing that away and making my own syrup using fresh ginger and no HFCS. Anyone tried this stuff? Thoughts on replacing the syrup? I just picked these up because one of the very, very few things I can’t find at Super H are really wide rice noodles, like I’d use for drunken noodles. The Thai grocery has them, but it’s far away. Actually, that Chinese grocery in North Charleston had them! Score 1 for N. Charleston (but 1,000,000 for Super H). I love aloe but I’ve just never bought it fresh. It was only $1 for this leaf so I figured, what the heck. Now I’m not sure what to do with it. Speaking of the cashier, who was Korean, she noted all the Korean food I was buying and seemed quite impressed by my selections. I’m now an honorary Korean! I’m off to eat my banchan…have a great weekend, and if you have any thoughts on these items, let’s hear them! I generally consider pasta one of those things that doesn’t need a recipe. I mean, basically you just toss it with stuff that tastes good together, right? Who needs a recipe? Unless you are perhaps doing something revolutionary with the pasta. This isn’t revolutionary by any means. But I had the urge to use the camera tonight, so I wrote it up anyway. It was also good and worth repeating, or I wouldn’t subject you to it. Prep the other ingredients: chop the tempeh bacon, artichoke hearts, onion, and tomatoes; drain the chickpeas. Heat some olive oil in a wok or large skillet over medium high heat. Add the onions and cook until translucent. Add the tempeh bacon and a few minutes later, the garlic. Add the sun-dried tomatoes and cook another couple of minutes. Add the cherry tomatoes, artichoke hearts, chickpeas, oregano, chili pepper flakes, pepper, and salt or seasoning and cook for two or three minutes. Add the white wine (or half the water) to deglaze the pan, then toss in the cooked pasta as as well as the water, mixing well. Optionally toss with vegan cheese. I served with roasted broccoli (tossed with a mixture of olive oil, fresh lemon juice, garlic, and salt and baked at 400 degrees for 15 minutes). This was a quick but tasty weekday meal, the pasta using all pantry items and therefore being easy to whip up with no planning. Some of you may recall that a year ago, I made miso. The year’s fermentation was over a couple of weeks ago but today was the first chance I had to check out the results. They were a bit surprising. The label on the crock tells me it’s ready. And the plate the sushi place near Luke and Lanet’s gave me! I didn’t find any soy sauce like I did at six months, but what’s this? The miso looks much darker. Removing the plastic wrap proved my eyes were not deceiving me: the miso really had turned from yellow to brown. At first I was disconcerted by this unexpected color change. But it didn’t smell strongly or bad: just pleasantly of miso. So I tasted a little bit and it tasted good…really good. I also remembered that I originally followed two recipes from different sources: the instructions GEM Cultures sent me, and the recipe in Wild Fermentation, and that though the two had been nearly identical, the former had called it “yellow” miso and the latter “red”, so I’d been very confused as to what to call mine. And at six months, it sure looked yellow. But I guess what happened is I made red miso. I’m going to let some of it age even further by keeping it in a cool place in the basement, but out of the fridge. It’s MUCH better than it was at six months. The texture is very much improved. You can still see the koji, which makes it appear to not be perfectly smooth, but it feels really nice. It’s like a very, very soft clay. I’d venture to say it tastes better than the red miso I have from the store. (It’s also darker than the red miso I have from the store.) I wish I could describe it better than just saying it tastes like…miso. It’s mellower than it was at six months, but much more complex. At six months, I still thought the store-bought stuff tasted better. This – this is pretty good stuff. To celebrate, I made miso soup for lunch. I may already have put miso soup up here somewhere, but well, if I did, this post is better. I don’t measure anything. This makes about two servings. Put a 4″ inch piece of kombu in two cups of water in a saucepan. Bring to a boil, cover, and simmer for 5 to 10 minutes. Keeping the heat on medium low, remove the kombu (you can eat it if you want) and add 1/2 teaspoon or so of dried wakame. I also add a splash of sake and a splash of rice vinegar, but both are optional. Add some diced tofu. Fortunately I just made a batch today, as it would have been a shame to stick store-bought tofu into miso soup made with homemade miso! Put a few tablespoons of miso in a small bowl – how much depends on how strong the miso you’re using is – and add some of the hot water from the pot, about 1/4 cup. Whisk together. Pour the miso into the pot and add some chopped scallions. You’ll commonly see it advised not to let the soup boil after adding the miso because boiling kills the beneficial enzymes. I don’t know if that’s true or not, but scalding hot miso soup isn’t nice anyway, so keep it just under a boil until you’re ready to eat. I also made Chili-Miso Noodles by cooking some udon, and whisking together 2 tablespoons of miso, 1 tablespoon of chili broad bean paste, a couple splashes each of rice vinegar and mirin, and about 1/2 teaspoon toasted sesame oil, heating this mixture briefly, and stirring into the noodles, then garnishing with scallions. I know some of you are suffering with me in the mid-Atlantic region, which was hit with two blizzards/near blizzards in a span of four days. We’ve enjoyed several years of mild winters and Virginia in particular does not budget or prepare for much snow, so this has been crippling. The federal and county governments have been closed for days and many side streets are impassable, even those that have been plowed. Four-wheel drive vehicles seem to be doing okay on our street, but neither Mark nor I can even get our cars out of the driveway. There’s a good 4″ of snow on the road – all the plow did was sort of push it down, not push it away – and Mark had to help the mail man get his truck out of an intersection the other day when it got stuck. (It just so happened that I’d made Mark lug home kitty litter from Wegmans, which was convenient timing for the mail man!) I’ve been walking up to Wegmans on good (non-actively blizzarding) days for exercise and to get lightweight things, but we won’t be driving anywhere for several more days. The street is hard to walk on because in most places, the snow is not compacted down, so you really have to trudge. And where it is compacted and smooth, it’s icy. Basically I AM MOVING TO AUSTRALIA. Or if that’s impossible, California, even if I am pretty sure they’re due for a huge earthquake. Anyway, I haven’t taken too many pictures, because I’m just sort of disgusted with snow, but here are a few from the first storm. Mark’s been, bizarrely, excited about shoveling. Which is fine with me! He looks like The Little Shoveler Who Could in this pic. This is my car. I had to go out at 3 am during the first blizzard and wipe it off because it’s a convertible and I don’t want the heavy snow to break the top, so this is just what snow was added to it until the next morning. By the end of the day yesterday, the level of snow was higher than the hood of the car; it looked like I’d driven into a bank of snow. This is the side yard. If you look carefully, you can see this is a fenced area. Inside that fence is the pool. Thinking about the pool during this weather makes me very sad. Especially since my swim classes have been cancelled all week so I haven’t been doing any swimming. I hope everyone else who’s been affected by these storms has been staying safe and warm. Unlike my poor friend Nona, we’ve had power the whole time, and we can both work from home, so we’re faring better than many people and I’ve no right to complain. Except I opened my last bottle of red wine last night and once that’s gone, I may have to complain. I think instead of juice and other healthful things, tomorrow’s trip to Wegmans is going to have to involve the wine store. I’m sure my Canadian friends are going to laugh at me again. But I’m REALLY over snow. And they’re predicting more on Monday. First of all, I’d just like to state for the record that I HATE SNOW. I am definitely moving some place that never sees so much as a flake of the awful stuff. Mark and I had plans to surprise his mother for her birthday on Tuesday by visiting her in Charleston. Due to a snow storm on Saturday, the day we’d planned to leave, we didn’t get to Charleston until Monday morning. On Tuesday, her birthday, she had to work from 8am to 8pm with a couple hours off in the middle, during which we got lunch. Since she’s off on Wednesdays, the family celebrated her birthday with dinner that night, shortly before which I looked at the weather forecast for back home and realized WE’RE SUPPOSED TO GET TWO FEET OF SNOW FRIDAY AND SATURDAY. Which meant we had to leave three days early in order to rescue Brachtune, as the cat sitter wouldn’t be able to get to her during a blizzard. I set a land speed record of getting us from Charleston to Fairfax in 7 hours, because I’m a race car driver. I didn’t let Mark drive because he drives like a granny. Anyway, the theme of our truncated visit, in my mother-in-law’s eyes, seems to have been “Convince Mark and Renae to move to Charleston”. High on her list of reasons we should move there are: 1) no snow and 2) no traffic. Both of which are excellent, and enticing, reasons, however, they are both countered with my reasons not to move to Charleston, which are: 1) no Asian grocery stores and 2) no Wegmans. So my mother-in-law set out to take me on a tour of Charleston’s Asian grocery stores to prove I could survive there. She did some googling for Asian grocery stores in Charleston and her top search result was my blog post complaining about the lack of Asian grocery stores in Charleston. Not a great start. Despite this setback, she dug up three addresses for Asian grocery stores, not in Charleston (which really has none), but in North Charleston, which is a whole other city about half an hour north, and she packed Mark and me into the car for a road trip. If that looks a lot more like a deserted office in an industrial park than an Asian grocery store, that’s because that’s what it is. That’s Hang Lung Grocery (that’s what was on the receipt), and I’m pleased to say their selection rated a B-. Just don’t wander into that Fresh Fresh Fresh Meat department in back. Trust me. … but they did have many necessary staples. They also had the world’s largest whisk! Thai Red Bull. At $8.99 for 10 bottles, it’s quite a bargain compared to the American stuff. Unfortunately, poor Mark was disappointed to find it tastes like syrup and is not carbonated. So I’m actually going to try using it as an extract and carbonating it myself through fermentation. I’ll let you know how that goes. All in all, Charleston’s definitely making headway, but something must be done about the Asian grocery store situation. Now, did you think you’d ever get to today’s recipe? I got only a couple hours’ sleep last night, got up at 5:30 am (which is typically a bedtime for me), drove across three states, battled pre-blizzard crowds at the grocery store when I got home, unpacked, did laundry, and basically ran around all day like a lunatic, all on a single meal of cold cereal eaten at 6 am (and a few snacks in the car), which, believe me, is extremely unusual for me: I get irritable if I go three hours without food. So when I finally had a moment to stop and make something to eat, I was exhausted and wanted something in a hurry, but it had to be “real” food and not just another snack. So here’s the nearly instantaneous soup I threw together. Bring the broth to a boil, then whisk in the gochuchang and rice vinegar. Add the rest of the ingredients, stirring the vermicelli well to avoid clumping. Heat for three minutes or until vermicelli is cooked. Note that the vermicelli likes to absorb liquid and will drink it all up if you give it a chance (so don’t overcook). We seasoned ours with sriracha for additional spiciness. Now excuse me, I’m going to go pass out.